Learning how to deal with Mini Roundabout! Mini roundabouts are often put in place of T-junctions in quieter residential areas. A mini roundabout offers two purposes; a junction between two or more intersections and an effective form of traffic calming. 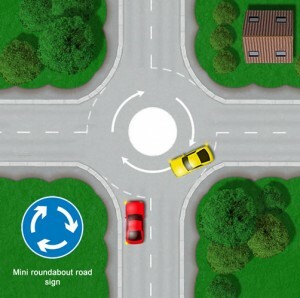 Due to the small size of mini roundabouts, they can often be confusing as to who has priority, especially for the inexperienced driver.This tutorial will provide the correct procedure for driving on mini roundabouts along with the correct rules for drivers, plus those learning to drive. Although the general procedure for using mini roundabouts is similar to their larger versions, due to their small size and placement, often found in narrower residential areas, a great deal of observation and care needs to betaken whilst dealing with mini roundabouts. Open And Closed Mini Roundabouts! Right Of Way At A Mini Roundabout! Turning Left at a Mini Roundabout! Turning Right at a Mini Roundabout! Tutorials and Guides Related ao Mini Roundabouts!